If your goal is to squeeze the highest level of performance out of your car, NEUSPEED sway bars are race-engineered to work in perfect harmony with all other suspension components, stock or aftermarket. With NEUSPEED , you get the ultimate in handling, safety and appearance. NEUSPEED sway bars are mandrel bent (which eliminates the gouges at the bends) using only aerospace quality steel that does not require heat treating– a process which can distort the bar and leave a rough finish. The ends are machined (in most applications where possible) to use precision ball-joints for precise control and alignment. Polyurethane bushings and custom formed brackets utilizing grade eight or better hardware make mounting very easy. Both front and rear sway bars feature a highly engineered bolt-on system of light-weight design that directly relates to improved performance. After being thoroughly inspected by NEUSPEED’s in-house QA people, a liquid-look, gloss black powder-coat finish is applied. 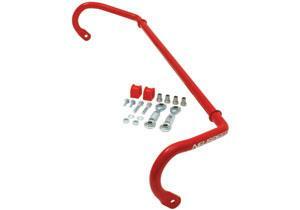 These are the same sway bars used by winning drivers in SCCA, NASA, IMSA and SOLO racing. When you purchase a NEUSPEED sway bar, you are guaranteed long-lasting performance, quality and a perfect fit every time.